On June 26th, The Minnesota Pollution Control Agency (MPCA) released a long-awaited study of nitrogen in Minnesotas surface waters. Overall, the study found that concentrations of nitrate (an important form of nitrogen) have steadily increased in the Mississippi River since the mid-1970s. On average, 211 million pounds of nitrate leaves Minnesota each year  roughly 158 million pounds  via the Mississippi River. Excess nitrate pollution poses three major problems for Minnesotas environment, economy, and quality of life. Human health: Nitrate in surface and groundwater used for drinking water can pose serious human health risks, and can lead to blue baby syndrome in infants exposed to high levels of nitrate. Maximum levels of nitrates in Minnesotas rivers and streams exceeded the states safe drinking water standards in 27 percent of monitored sites. Aquatic life: Elevated nitrate levels can be harmful to fish and aquatic life, threatening fish and habitat in rivers, lakes and streams. Gulf dead zone: Minnesota is the sixth highest contributor of nitrogen to the Gulf of Mexico. This excess nitrogen contributes to the Gulf dead zone, an area of oxygen-depleted water that suffocates marine life in the area. The dead zone adversely impacts commercial and recreation fishing as well as the overall health of the Gulf ecosystem. According to this new study, 73 percent of Minnesota nitrate pollution comes from cropland, primarily through agricultural drainage systems below cropped fields and by nitrate pollution leaching into groundwater, and then moving underground until it reaches streams. 78% of nitrate pollution to the Mississippi River in our state is from agricultural sources. 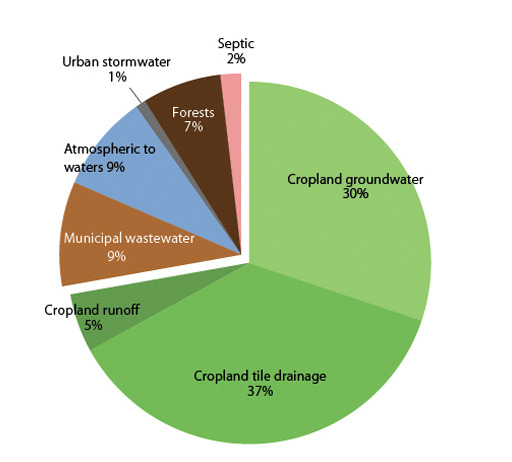 Other sources include Municipal wastewater treatment systems (9%), atmospheric deposition (9%), septic systems 2%) and urban runoff (1%). Nitrate pollution varies throughout the state, and is generally highest in the Minnesota River basin area where cropland sources account for as much as 95% percent of the nitrate load. These heavily cropped and drained watersheds leech excess nitrate fertilizers into underlying tile drains and groundwater, with devastating results. The largest culprit is, not surprisingly, agricultural drain tile systems. Overall, about 37% of total nitrate pollution comes from these drain tile systems that use underground pipes to quickly move water (and nitrate pollution) out of the soil and into nearby surface waters. Minnesota currently lacks any permitting, reporting, licensure, or monitoring requirements for new or existing drain tile systems. Nitrate leaching into groundwater below cropped fields and moving underground until it reaches streams contributes an estimated 30% of nitrate to surface waters. Since many communities rely on shallow ground water resources for drinking water, this pollution also poses a direct threat to human health. Drinking water that exceeds the safe drinking water standard of 10 parts-per-million poses a direct threat to human health, and can lead to blue baby syndrome in infants. Overall, the report reveals that addressing the increasing levels of nitrate pollution will require new strategies. Traditional voluntary conservation programs (subsidized by the general public) have yielded limited results, even after decades of implementation. The MPCAs study does identify three major strategies for reducing cropland nitrate losses to waters. In-field nutrient management (i.e., optimal fertilizer rates; apply fertilizer closer to timing of crop use). The study notes that up to a 13 percent reduction in nitrate pollution can occur if changes to fertilizer use are universally adopted by farm operations. Tile drainage water management (i.e., tile spacing and depth, controlled drainage, constructed wetland treatment, and bioreactors). Additional reductions can be achieved if conservation drainage controls were installed on 100% of drain tile systems in Minnesota. Landscape diversification (i.e., cover crops and perennial cover). Shifting from our current corn and soybean cropping systems and embracing cover crops, perennial crops, and continuous living cover systems will be essential tools in addressing nitrate pollution. The MPCA is also working with the U.S. Environmental Protection Agency and other states to evaluate the effect nitrate has on aquatic life in order to develop and adopt toxicity standards. This standard will be an essential tool in holding nitrate polluters accountable for clean, healthy waters in Minnesota, and is due for completion by January 2015. In addition, a state-level nutrient reduction strategy is being developed to address Minnesotas contribution to the Gulf of Mexicos hypoxia issue. 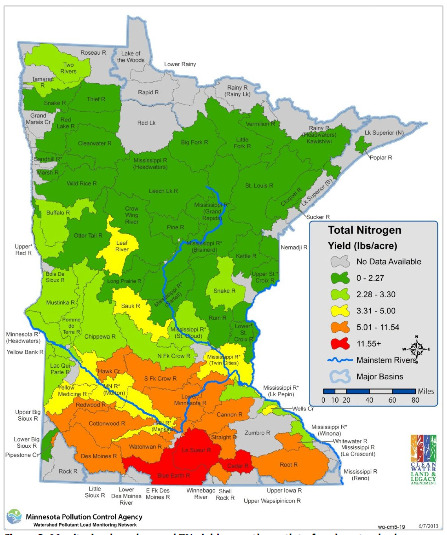 Minnesota contributes the sixth highest nitrogen load to the Gulf. The strategy will identify how further progress can be made to reduce nitrate and phosphorus entering both in-state and downstream waters. The challenge before us is clear: Minnesota must restore our waters and live up to our responsibility to those who live downstream. We look to the Dayton Administration to work with concerned citizens and advocates, farm operators, the University of Minnesota and others to develop new measures that will protect the water we drink and the future of farming in Minnesota. For more information on this study, visit the MPCAs website. Recent media coverage of the story can be found online. Coverage includes articles from The Pioneer Press, The Star Tribune, and Minnesota Public Radio News / Daily Circuit. For more information on this issue, please contact FMRs Watershed Program Director Trevor Russell at (651) 222-2193 x18 or trussell@fmr.org.